Use your existing PCI Express connection to expand to an additional 4 PCI Slots in your system, the CGS-1PCIe4x is a scalable plug and play PCI enclosure that maintains High-Speed and Backward compatibility. Designed to expand PCI connection slote into 4 from PC host. The CGS-1PCIe4X PCI Express to Quad PCI Slots Expansion Box is specially designed to expand 4 extra PCI slots from a PCI Express Slot. The “no latency” bandwidth is 2000Mpbs allowing you to run variety of external cards, even PCI-X graphics cards, SATA RAID Cards, SCSI RAID, Etc. It includes a PCIe adapter card, a cable and the slot box itself. The box is powered by a 12VDC AC adapter. It provides instant PCI bus expansion via the PCI Express Bus (PCIe). PCI Express provides a scalable, high-speed, serial I/O bus that maintains backward compatibility with PCI applications and drivers. The CGS-1PCIe4X PCI Slots Expansion Box’s architecture defines a high-performance, point-to-point, scalable, serial bus at speed of 250Mbytes/sec to 4GBytes/sec (and 8Gbytes/sec in the future). The PCI slots of the box are fully Plug-and-Play compatible and no IRQ and I/O address conflict problems. The CGS-1PCIe4X provides the scalability to quickly adapt to new PCI Express technologies for legacy PCI add-in cards. It allows you to add PCI connectivity as needed. 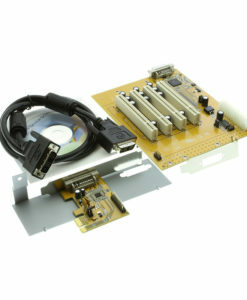 This PCI-e to 4X PCI Slot Expansion Enclosure by itself is unaffected by the operating system in which it will be working with, it is a separate entity until connected to the computers PCIe card. 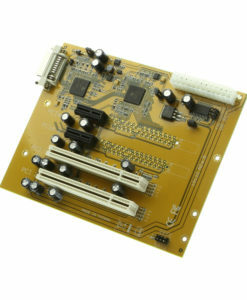 The PCI cards installed in the computer that is used with the expansion enclosure (any expansion enclosure) must have drivers that are compatible with the operating system they are working with. Because of Operating system changes in the computer industry, not all installed PCI cards will work with your PC’s operating system, therefore, you must go to the card manufactures website to download an updated driver that will work with the operating system on your computer.